Happy 4th of July residents of Altamonte Villa Apartments – can you believe June is over already? Where does the time go? Well, you know what they say…"time flies when you're having fun," the classic saying stays true over and over again. Anyways, what are your July 4th plans? Whatever they may be, try out this easy, quick recipe found on Pinterest with ONLY 3 ingredients involved! 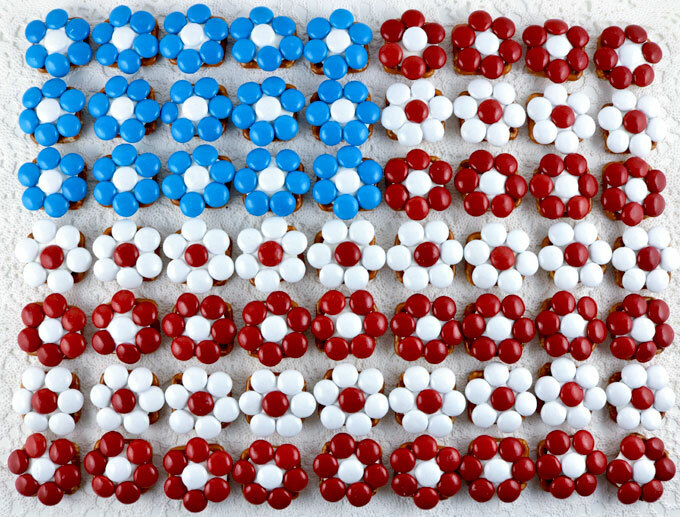 The Patriotic Flower Pretzel Bites includes: Pretzel Snaps, Wilton Bright White Candy Melts, and Red White and Blue Holiday M&M's. Could it get any simpler? To start off, lay out the Pretzel Snaps on a microwaveable plate and layer the tops with the Wilton Bright White Candy Melts. Pop the plate in the microwave for 45-50 seconds and take it right out. Generally, this will melt the candy enough to be able to place the M&M's gently on top. Place the M&M's whichever way you like, have fun with it! Just remember to place the "m" side down when placing it on top of the pretzel. Reference specific details with picture-by-picture here. This will help if you need any further assistance!